The association is a private, non-profit organization that owns and operates the Beaufort Historic Site, which is a collection of 10 unique buildings and homes within the downtown region, in addition to an extensive local "Welcome Center." As the third oldest town in North Carolina, Beaufort has a lot to be proud of, including a handful of homes which date back to the 1700s. The Russell House is the oldest, built 1732, and is the current home of the Mattie King Davis Art Gallery. The Leffers Cottage, a rustic white cottage, dates back to 1778 and showcases artifacts of the daily chores during the Colonial period, including cooking, spinning, sewing, candle making, and weaving. The brick red Carteret County Courthouse, built 1796, is the oldest wood-framed courthouse in North Carolina, and the Old Jail, built 1829, is a favorite historical attraction for young and old visitors alike, comprised of 28" thick walls, and filled with more than its fair share of local ghost stories. The Apothecary Shop and Doctor's Office, built 1859, is the smallest structure among the collection, and is stocked with medicinal and pharmaceutical artifacts, while the John C. Manson House and Josiah Bell House, (both built in 1825), serve as two decadent examples of residences of some of Beaufort's most prosperous residences. There are also two gardens to explore, the Leffers Garden which showcases a typical Colonial era garden landscape, and The Herb Garden, which borders the Apothecary and Doctor's Shop, and features a wide range of plants and herbs that were instrumental for both medicinal and cooking purposes. The Old Burying Ground is also a popular site, with graves that date back to the 1710s, when the cemetery was first surveyed and created. The individual sites are listed in great detail, and a complete account of the historic graves can be found on the Beaufort Historic Association's website, http://historicbeaufort.com/burygnd1.htm. All of these buildings, sites, and gardens are maintained by Beaufort Historic Association staff and volunteers, and tours of three of the most distinctive sites are available for a nominal cost. There's also a Historical District Double-Decker Bus Tour, which escorts visitors through the downtown region via a 1967 English double-decker bus. Experienced tour guides identify points of interest, as they spin tales of pirates, Confederate spies, and lost loves. 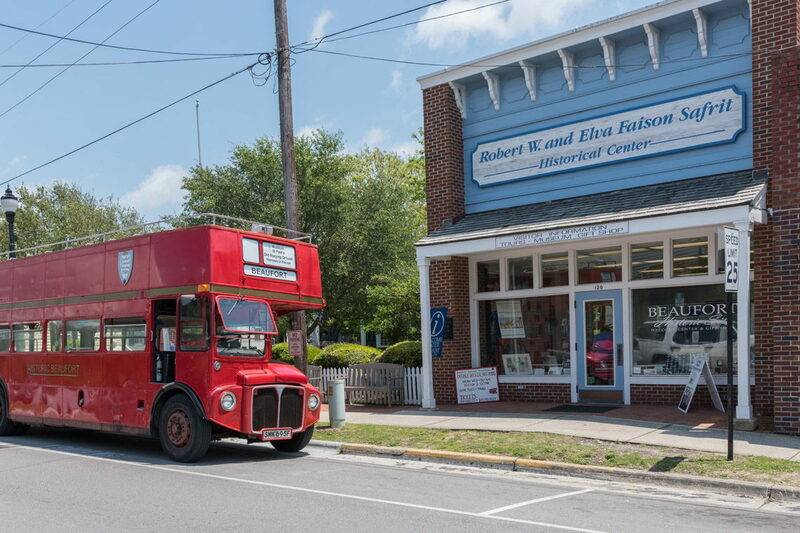 Tickets for the bus tour are reasonably priced and available at the Beaufort Historic Site. The Old Burying Ground also features its own special tours, where guides detail the history of the cemetery's most notable permanent residents. Tours are seasonal, typically from June through September, and are held Tuesday through Thursday, at 2:30 p.m. For more information about tour departures and availability, contact the Beaufort Historic Site at (800) 575-7483. The Beaufort Historic Association also hosts a number of events throughout the year to fund their organization, and ensure that these local sites continue to be expertly maintained and wide open for visitors. A favorite event is the annual Old Home and Gardens Tour, an extensive tour of Beaufort that has been going strong for well over 50 years, and which has earned a spot on Southeast Tourism Society's "Top 20 Events for June." Tickets can be purchased well in advance of the early-summer tour online. Other notable events include holiday affairs, including Easter Egg Hunts, Valentine's Day parties, a winter candlelight tour, regular Art Walks, and historical lectures and programs that bring the history of these homes and buildings to life. Many of the sites are also open for romantic weddings, receptions, and other special events, and large groups and brides-to-be are urged to contact the Beaufort Historic Site at (800) 575-7483 for availability, amenities and any associated fees. With one of the best-preserved collections of historic homes, businesses and gardens in North Carolina, mostly conveniently contained within a few city blocks, the Beaufort Historic Association has certainly honored its goal of bringing Beaufort's distinct history to light for thousands of visitors every year. Plan a self-guided walking tour, or enlist the assistance of the expert docents for an in-depth look, and see why this small town still holds a fascination for travelers hundreds of years after it was founded.